Data mapping and mining is at the center of everything we do at Health Decisions. We have had 100% success in getting access to payer files, as well as having a 100% compliant HIPAA track record. 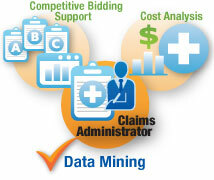 Our team works to correct inconsistencies and inaccuracies between payer and employer data. We combine payer data “Silos” to find “New but Known” facts. This creates 300+ data quality checks at file, record, field, content, and coding levels. The process requires no new programming; just data and documentation. And Health Decisions creates a new data asset that is Microsoft® compatible, never losing connection to source data.